Researchers think they have a better understanding for how ancient North Americans thrived for centuries in northwestern New Mexico's arid desert. A multidisciplinary team of experts from the University of Cincinnati determined that the sandy soils of Chaco Canyon were not too salty to grow crops such as maize, beans and squash for the more than 1,200 people who occupied this beautiful but harsh landscape during its most prolific years. Researchers have long debated whether the people who lived here between 800 and 1300 AD were self-sufficient or relied partially or entirely on imported food to survive. These ancestral Puebloans built elaborate adobe structures, some of them four stories tall and recessed among cliff faces under the hot New Mexico sun. Some previous research suggested that the desert soils simply were too saline for agriculture. The implication was that Chaco Canyon could not support a large resident population without lots of outside help. Alternately, researchers speculated that Chaco Canyon, a place of religious importance, maintained a small resident population that served and benefited from a larger population of visitors making pilgrimages. But UC's soil analysis suggests that the most significant challenge for growing crops was irrigation. That's where ancestral Puebloans demonstrated particularly adroit farming skills and perceptive land management, said Jon-Paul McCool, a UC graduate and lead author of the study. "The major limitation is water. You couldn't rely on rain for field agriculture," McCool said. "You'd have to gather and control water, which we know people in the region did." McCool earned PhD and master's degrees in geography and museum studies at UC and now teaches at Valparaiso University. Chaco Canyon has evidence of constructed canals — water-diversion channels designed to direct rainfall to farm fields. "If you have a population of 1,200 people, how did they survive?" McCool asked. "The part I'm interested in is the interrelationships between people and their environment and how each of them influences the other." The study was published in June in the journal PLOS ONE. One prevailing theory is that residents of Chaco Canyon depended heavily on outside assistance for sustenance. But the most likely resource for imported agriculture was in the Chuska Mountains on the Arizona border, more than 50 miles from Chaco Canyon. Traveling great distances in a dry environment is commonplace in other parts of the world. But what makes travel in the ancient Southwest especially taxing is that every step was taken on foot — human foot. Ancient North Americans had no camels, horses, mules, llamas, alpacas, oxen or sled dogs to carry supplies. There were precious few navigable waterways. So if you wanted to bring something on such a trip, you were carrying it every step, said Nicholas Dunning, a professor of geography in UC's McMicken College of Arts and Science. "You have to go to the Andes before you find a native beast of burden in the New World," Dunning said. "So if you're using human porters, you quickly reach a point of diminishing returns." Dunning said the study was able to determine that the soils could support agriculture in Chaco Canyon and that irrigation canals found at the site were built at least as early as the eighth century. "The evidence is compelling that they produced most of the food that they consumed in Chaco Canyon and devised sophisticated irrigation strategies to do it," Dunning said. Today, Chaco Canyon sees about 9 inches of rain per year, four times less than the breadbasket of the American Midwest. To make the most of this precious resource, ancestral Puebloans built elaborate canals to divert rainfall to their farm fields. UC researchers re-examined soil samples taken from sites in and around Chaco Canyon. While some of these sites indeed did have saline levels too high to support agriculture, that was the exception, researchers found. Instead, researchers found that the desert soils were not much different from soils in other parts of the Southwest where agriculture was practiced. "The evidence is persuasive that they grew their own food," Dunning said. "My experience in traditional societies is farmers and agricultural populations are very risk averse," Dunning said. "So you tend to think in ways of making sure you have enough to eat yourself each year along with seed for next year." UC's team consisted of geologists, archaeologists and biologists. They spent weeks each summer studying different aspects of Chaco Canyon. Many of the study sites are accessible only by foot so researchers would hike in at dawn before the afternoon heat became too oppressive. A collapsible tent shelter provided some relief from the sun. Researchers could drink as much as four liters of water each workday, packing in provisions and packing out soil samples. Dunning said New Mexico's evening sky was full of stars. "The skies were extraordinary. We were there for the Perseid meteor shower," Dunning said. "The environment is quite amazing. We would set off for work before dawn. We wanted to be at the excavation sites before the sun came up because the morning was the only decent time to work." UC's research is adding to what scientists already know about ancestral Puebloans in New Mexico. These former occupants of Chaco Canyon left behind evidence of having traded goods with people from distant places. Archaeologists have found seashells from California and macaw feathers and cacao from Mexico. Co-author and UC research associate Samantha Fladd thinks it is improbable that residents would rely on regular deliveries of staple goods from places so far away, especially if they could grow food themselves. "It seems highly unlikely that this would be a sustainable system," Fladd said. "It makes more sense to me that there would be trade relationships where populations would help each other in bad years. To rely on one location for most of your food would not be the most sustainable system," she said. "I would be skeptical you would see that much patronage." Fladd said a round trip between Chaco Canyon and the Chuska Mountains would take as long as a week, depending on how many supplies were carried. The people of Chaco Canyon left behind petroglyphs carved into the rock — drawings of animals, people and symbols. These included the famed "Sun Dagger," a notch in a slot canyon that casts a dagger-shaped beam of light onto a shaded rock face upon which is a carved petroglyph spiral that marks the sun dagger's path across the wall over the four seasons. They also were known for their turquoise carvings, including a famous frog figure among the collection of the National Park Service. UC professor emeritus Vernon Scarborough, one of the paper's co-authors, spent his career studying ancient land-use strategies around the world. Chaco Canyon demonstrates how people were able to engineer their landscape in a resourceful and sustainable way, he said. "Chaco Canyon captures the ingenuity and creativity of the human spirit like few other places," Scarborough said. "Our work and that of other colleagues is beginning to show the significance of low-tech adaptations in attempting to accommodate life on Earth," Scarborough said. "A greater understanding of just how these ancient, 'primitive' systems adapted and function merits a thoughtful assessment given the social and environmental stress we face globally today." 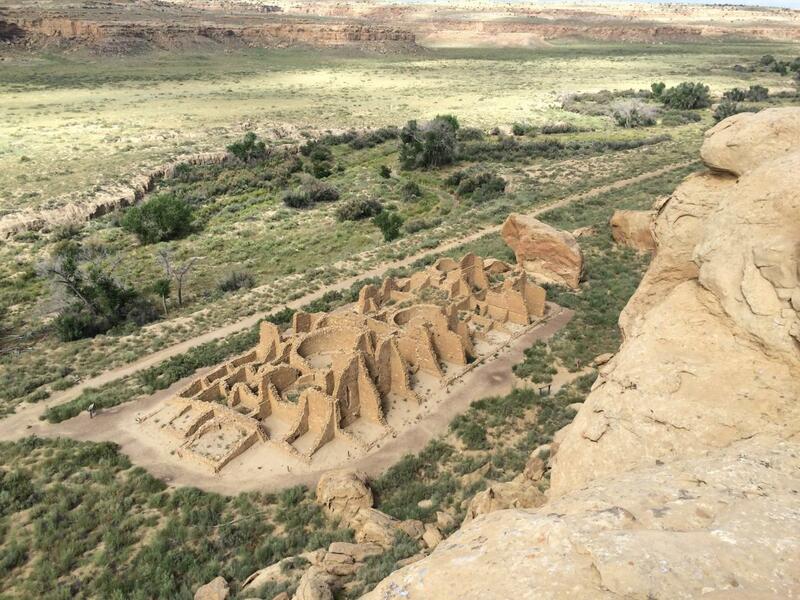 Scientists still aren't sure why the population of Chaco Canyon declined over the centuries. Chaco Canyon continued to be occupied intermittently after 1300. "Every civilization comes to an end. But they went through a lot," McCool said. "What strategies allowed that civilization to continue? You're dealing with people who lived in a place for hundreds of years. What adaptations did they make to deal with changing circumstances?" Fladd said when she goes to Chaco Canyon, she likes to hike up the Pueblo Alto trail. From the top of the mesa, she can survey all of Pueblo Bonito below her. "I don't want to pretend I can understand their concerns 800 years ago," Fladd said. "But I am in awe of what they were able to do. It's a testament to how adaptable and creative they were." Chaco Canyon has a long history of generating academic debates, in part because it's such a fascinating place. Chaco Canyon has been studied or referenced in thousands of research papers. "Archaeology is a fun science because it requires a lot of imagination," Dunning said. "You're never dealing with complete data sets, so one has to fill in the holes. That's where the controversy comes in." The study was funded by the University of Cincinnati Research Council, the Charles Phelps Taft Foundation and the Court Family Foundation. Co-authors included UC professors Lewis Owen, Brooke Crowley, Kenneth Tankersley, David Lentz, Warren Huff and Christopher Carr as well as UC graduates Elizabeth Haussner and Jessica Thress. Other contributors were Stephen Plog (University of Virginia), Adam Watson (American Museum of Natural History) and Katlyn Bishop (University of California).